1. Anesthesia: Use topical anesthetic (20% Benzocaine) enclosed. 2. 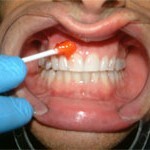 Localize with Lidocaine w/epi around gingival mucosa of dental alveolar injured segment. 3. Retraction: Use cheek retractor supplied to retract lips to allow access to tongue or injured mucosa.